I have been doing a lot of sewing for other people- no complaining mind, I like to sew for others, especially creating something with a certain person or place in mind. You remember the little tea cozy that went to Liberty's- here it is in all its fine surroundings, along with the tea cup- made using Laurraine's pattern. You can see more Liberty Lifestyle makes, like Katy's Ferris Wheel at their Facebook page. 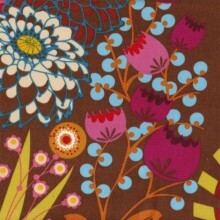 Ayumi has now received this tray which also featured Liberty Lifestyle fabrics. It was made using her cutlery tray tutorial but on a much larger scale- this is in-tray sized to store works in progress. It now lives with Ayumi along with Penny's spool/button basket! Details on how to adapt Ayumi's tutes to make these coming soon at Sew-Ichigo. I have more Liberty Lifestyle makes planned, I'll show soon, just have to actually make them! I have also been working on a big project for Annie at Village Haberdashery- big as in a large item! It is a double duvet cover, made with Lotta 'Bella'. I wanted to make a large scale item for these big prints. These are 8 inch equilateral triangles. It is a weighty beast! But I am really happy how it turned out. Details on how to make it are coming to Village Haberdashery blog soon! It needs to travel to Annie first for a photo session- that all sounds very glamourous! The birthdays are all done. Lula had hers yesterday and we seemed to have unintentionally gone for an Ichigo-Strawberry theme. The doll is Hini Ichigo, a Pullip and has not left Lula's side since she opened her box. We made the cupcakes for her girl friends and much lovely birthday fun was had be us all. The Hello Kitty rice paper hearts and cup holders can be found on ebay. Penny sent her a vintage waist pinnie- so cute and a perfect fit. And I made her a soft and huggable pillow using Ayumi's new popsicle pattern for Super buzzy- more strawberries here too! The middle lolly is filled with a mango sorbet- in my imagination obviously- as this is a favourite with L. I was recently sent some Art Gallery fabrics by the kind folks at Hantex and this fabric from their Floral Elements blender line really reminded me of Mango and the flower print added a little ice texture! Art Gallery fabrics really do feel different. They remind me of the smooth and silky cotton of Heather Ross Munki fabrics. They are fine with a delicate sheen- I've tried to capture this with a extreme close up! This makes them a delight for paper piecing. 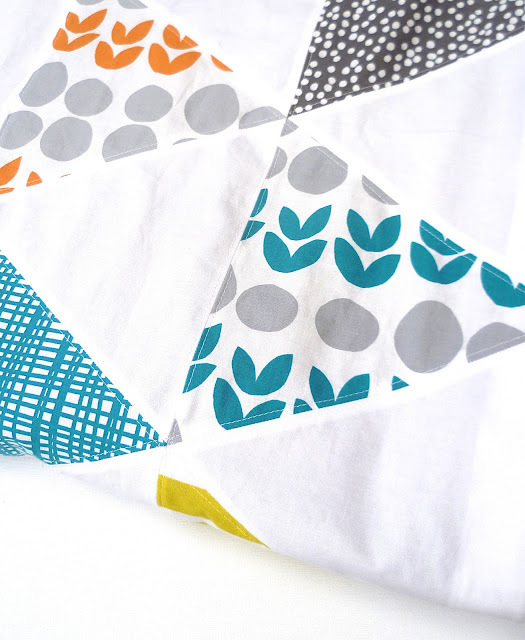 Bulky seams are an occupational hazard with foundation piecing and a finer fabric which still has the strength of quilting cotton is a boon for seams. I wanted chocolate all around the 'bite' of ice-cream like Ayumi's orginal Ringo Pie block so you can imagine the potential for lumpy bumpy layers here but the Art Gallery cotton really helped keep seams flat. 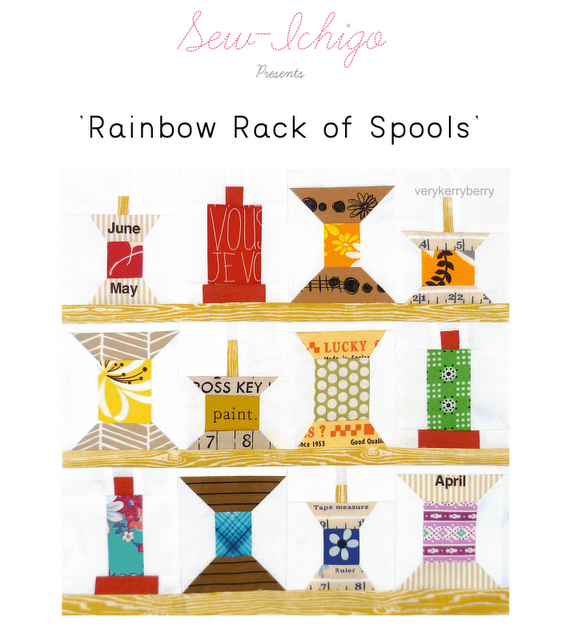 The new LillyBelle line by Bari J for Art Gallery has been catching my eye since I saw the illustrations in the 'Inspiration booklet'. There is a big focus on clothing so I thought I would try a couple of the LillyBelle prints- I plumped for Henna Stripe in grey and mustard boards for the fabric line. There is a video too so you can see the fabrics in action and get a feel for the colours and the story behind the print. 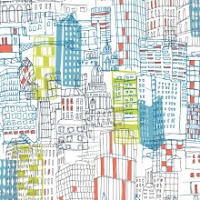 I like this style of promotion with a narrative of how the designs link together and where they have come from. This is my next dressmaking project. And a now time for a mini giveaway! 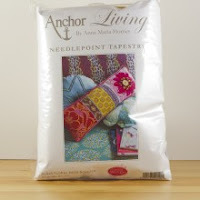 Four fat quarters which include a couple of solids, a couple of floral elements blenders and a Lace elements print. By the way, if you are reading Art Gallery, I would love some polka dot or thin strips in your blender lines- that would be mighty fine. Thankyou to all who took part! In the meantime, if you want to find more Art Gallery fabrics including the freshly available LillyBelle and the coming very soon "Indie" by Pat Bravo (check out the 'Tapestry' print for great clothing fabric) this link will take you to UK stockists online and local shops. I know Annie at Village Haberdashery has LillyBelle in at the moment too. Usual giveaway rules apply- if I can't find your email I will not be able to contact you if you win so please add to your comment if needed. I'll randomly choose a winner in a week x Looking forward to the recipes and recommendations! Giveaway closed and the winner has been notified. Just a couple of years ago I struggled to find text prints on and would snap up any that I discovered quick as they were such hot property. Since then, availability has improved so much and they are much more widely used. Amy Friend is running a Texty challenge- Texting Whilst Sewing contest. The aim is to use text fabric imaginatively in a 12" quilt block. I am lucky enough to be judging the top ten entries with Ayumi! There is a lot of potential with such an open brief for creative ideas and there is ample time - entries need to be in by the end of August. 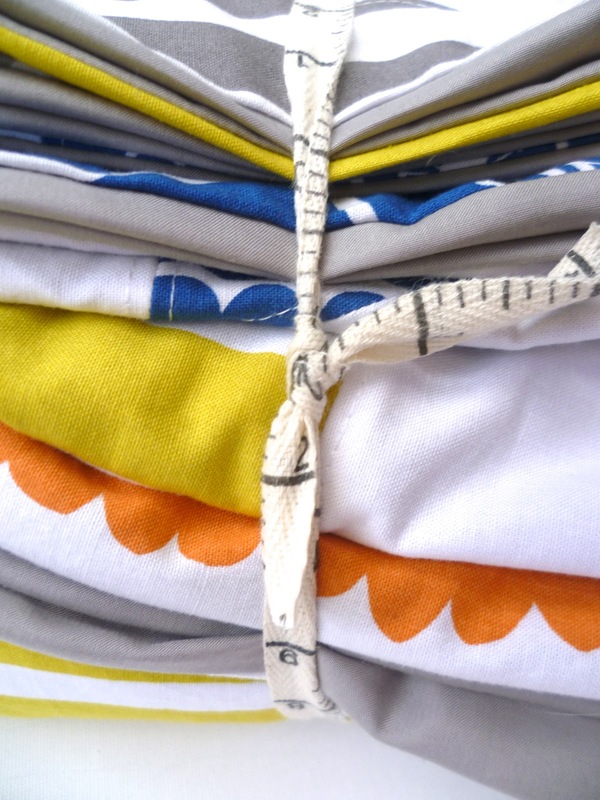 Text fabrics are an essential part of my stash and I find they fulfill a range of functions. They are great blenders, providing background interest and texture, as seen in this graffiti print by Keiko Goke for Yuwa. White/cream fabrics with a mono print are so useful- they lighten a mix of fabrics and provide a bit of space whilst the dynamic scribbles create direction and a bit of life! This print by Yoshiko Jinzenji develops abstract lines adding pops of colour, illustration and text. I bought this a while ago and as soon as it arrived I realised how great it would be for clothing. 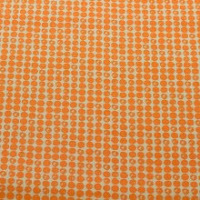 It is a very fine cotton- you can see the print of the layer underneath- and the print is random so needs no matching up. 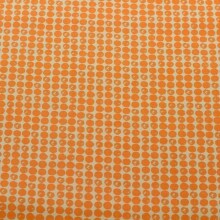 Effective number prints can be a bit harder to find and designing a print with a twist is more of a challenge for the fabric designers. This is a Sukuko Kosekit fabric, 'What's the Time' The curves were exactly what I needed when i planned the grocery scales block for Ayumi's Vintage grocery store theme Ringo Pie. The background is a lovely pinky shade of cream too, a nice variation on neutral colours. Other text prints lend themselves to fussy cutting. This is another Suzuko Koseki print. You can find a coral colourway available here. There are instant images and text so you can almost code your work with messages! 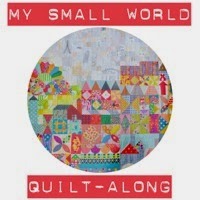 I sometimes feel like my mini quilts tell a story with fussy cut words and pictures. 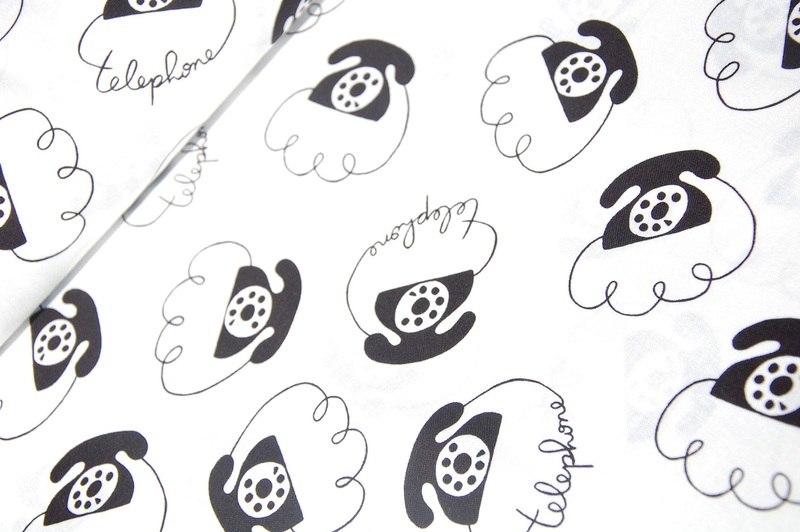 This Kei fabric is also ideal for fussy cutting, love those cute retro telephones- the cord making the word is genius! You can find a good variety of text prints at Eternal Maker- look under Numbers and Letters Fabrics and also under Japanese Imports. I hope some of you feel inspired by Amy's competition to have a go and submit a block- I look forward to seeing what you come up with- and check the prizes out, that might be enough to push you over the edge to enter! I heard about this on Twitter from Katy and as soon as I saw a picture I was smitten. I held back form an immediate purchase just in case it was a passing fad but no, it kept creeping back in to my mental library of quilt images. It is expensive, imported and then sent via Europe but it is worth every single penny. 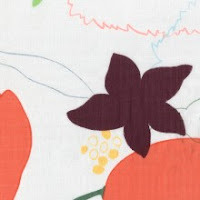 Sometimes a book comes along which changes your creative ideas- I remember buying Suzuko Koseki's Machine Made Patchworks- now Patchwork Style and it changed so much for me. This book is in the same catergory. 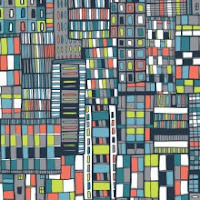 Brigitte Giblin is a talented quilter who was born in France and lives in Australia. This combination has created a beautiful chateau/Ayer's rock colour scheme that runs through all her quilts and astounds me every time I look at it. Many of the quilts are english paper pieced but there is machine piecing and foundation and there is constant inspiration. The photographs are stunning, quilting eye candy everywhere. 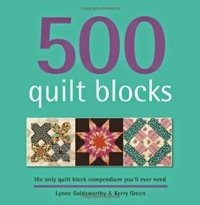 When I sit and browse this book, my husband cranes his neck over too and comments on how much he likes the quilts. This is not a normal occurrence! We were both drawn to 'Dancing Dollies'. The organic pieced and appliques shapes reminded us of the geometry found in sea shells and a vintage book full of similar pictures. I already know that I have to make this beauty, Tessellations II. 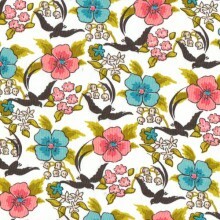 I have some larger floral prints and a colour palette of jewel like prints. 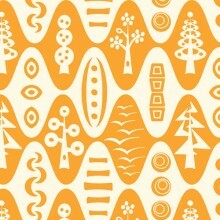 I am going to attempt to machine piece this- we'll see how that goes- but it will mean constant Y seams. I am not usually a big fan of hexagons but this book, along with Tasha's Hexa-go-go is changing that. 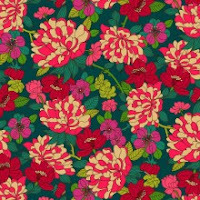 I am seeing them differently and I am also look at large florals- Martha Negley, Kaffe Fassett and Philip Jacobs and wanting to add these to my stash. And Brigitte's blog is here. I have already contacted her with a query and she is quick to respond and very helpful. 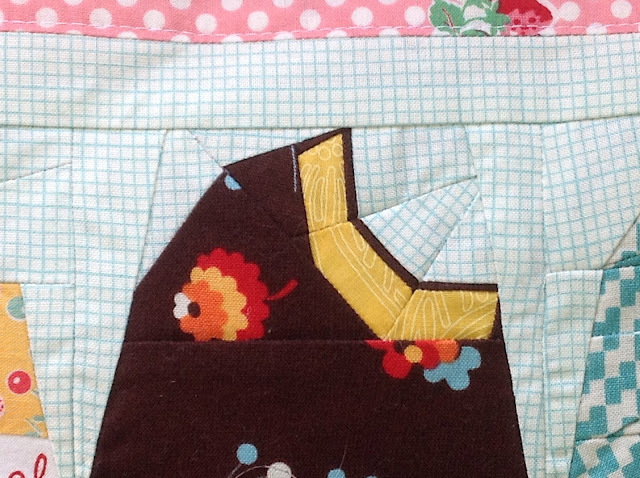 There are also tips and pointers for the quilts and techniques. Today you can find me at Plum and June having a little ramble about blogging voice. 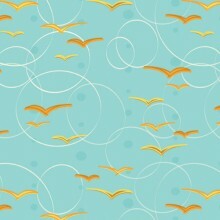 There is also a great giveaway for Sew Fresh Fabrics so worth popping in and taking a look. Thankyou to Beth for inviting me to take part in her Advice for New Bloggers feature and a thankyou to Ayumi, Lynne, Anna Maria Horner and Katy for being shinning blogger examples! If you have a spare 10 minutes and a small piece of cute fabric, you may also want to visit Emily's blog where you will find how to make a Wiggly bag for a Devon NHS trust local to my area. These are used for all ages of children- toddlers to teenagers and hold the Hickman lines when they are undergoing treatment in hospital. She gives all the making details and they could not be more simple. It really does take 10 minutes. I know Hadley's on to this with a couple made already, all the details are at Emily's and she will email you where to post. It may be worth checking with your local NHS trust too as there are variations on this wiggly bag used in other hospitals. End of term is always hectic and the summer holidays are always welcome. Only 1 week to go. I am also about to hit birthday season with Damian's and Lula's only a week apart. 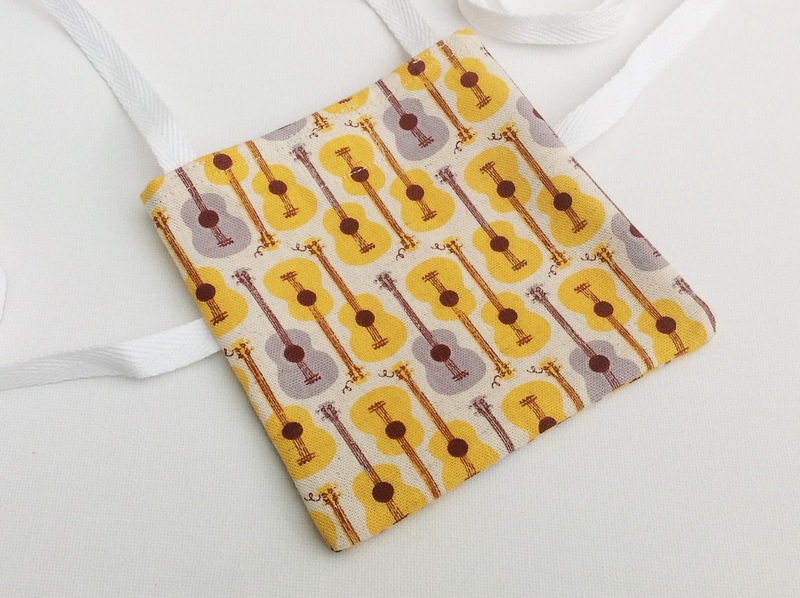 So I am in the middle of a little birthday prep and a big project with these for Village Haberdashery- Annie says the Bella will be available soon. In the midst of sewing nearly 200 triangles together I like to distract myself with mini makes. After seeing Lynne's Amities BOMs and loving every block and every fabric, I joined Amitie's Stash club. They send 16 fabrics each 25cm square every 2 months. 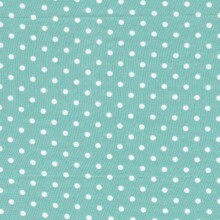 I usually like to select fabrics for myself but there is something very reassuring about handing over to Jeni and just waiting for it to arrive. I love the colours and the mix of large and small prints. As a little bonus, they include a 8" block pattern. This month's is Amish Cross. It comes with easy rotary instructions and was a breeze to stitch together. I have particular plans for these. I just enjoy the journey and the knowledge that one day they will become something. You can find the details of the Stash Club along with BOM and other regularly mailed out lovelies here. Maybe it is been British but it feels a little embarrassing to pat myself on the back sometimes and blog about this but I have just been published in a British quilting magazine, the sort of magazine that you can actually go into WHSmith and buy. My granny will be thrilled. 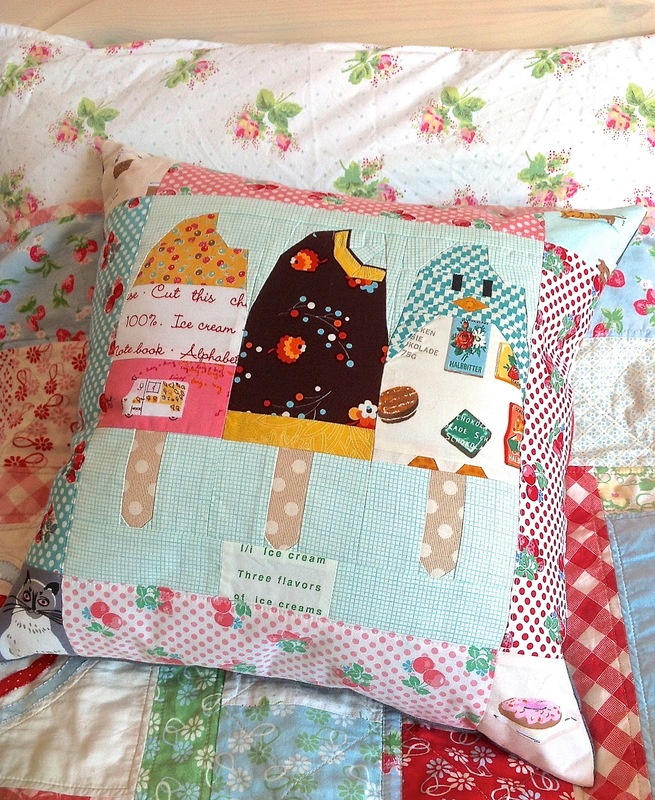 And that is Julianna's quilt and pattern you can see on the cover! 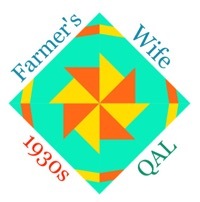 Modern Quilting has had a chequered history recently, you can read about that here so I was surprised that this issue did actually get published. There have been a lot of ins and outs with this company and I am familiar to their ups and downs in the early days of Sew-Hip magazine so I went into an invitation for an interview and to write a pattern with my eyes wide open and to be honest, just hoping for a bit of publicity for Sew-Ichigo. All the people I dealt with, both in this issue and previously have been courteous and straightforward and I am guessing many lost their jobs between issue 2 and 3 as ownership altered. The new editor Jenn has been working flat out and this must have been a difficult issue to deliver but she did it and I am delighted with the interview and photos. Seeing my name in large letters across the page was a slightly surreal moment- I had Lula and Damian with me at the time and I was carrying the bag you can see on the right in the magazine. I sent a few pics to show Penny, she congratulated me on my wise words on 'narrative quilting'- don't remember that I thought, and besides I am not really sure what narrative quilting is. Turns out that a little of the previous feature must have migrated to the start of my interview! I guess that reflects that hard time all at Modern Quilting has picking up a set of articles from the previous team and having to start afresh. It is a great issue, lots to read and make- quilts, English paper piecing, Joel Dewberry interview and of course Narrative Quilts. My table runner pattern is in next months issue, so another bashful post is to come. So I will quietly blow my trumpet and run away a little embarrassed by it all! We were meant to be on a little holiday this weekend but the weather conspired against us and we realise on Friday there would be little chance in going. As it turned out there were floods on the route we were going on and it has been bad in Devon- though not where we live- so a staycation has been in order. Yesterday I spent a bit of time just playing with ideas, not something I do very often but I should, it leads me to new places! These are Secret Garden blocks, similar to Cathedral Windows, I followed a tutorial here. They are not especially hard, all hand sewing and easy to cut out. Mine are 2.5 inches square. It was a test run for my Brit Mini Quilt swap partner so I am waiting to see if s/he comments. I also got a chance to make an ice lolly from Ayumi's new popsicle pattern for Superbuzzy. It is the first of a series of Block of the Month patterns! If you haven't done much paper piecing, this is an idea pattern as it is very straightforward. 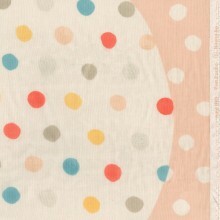 This will be for my daughter, an ice lolly pillow, a surprise for her birthday. And as I wasn't away I got a chance to go the car boot sale. I saw all the fabric ladies- Mary + daughter, Wendy and Barbra and they had fun rummaging in some scraps from my car boot that I brought along for them. It was actually sunny so a lovely morning and I could not resist this little beauty! Find them both here, and look out for the multi-buy offer when you buy both patterns! 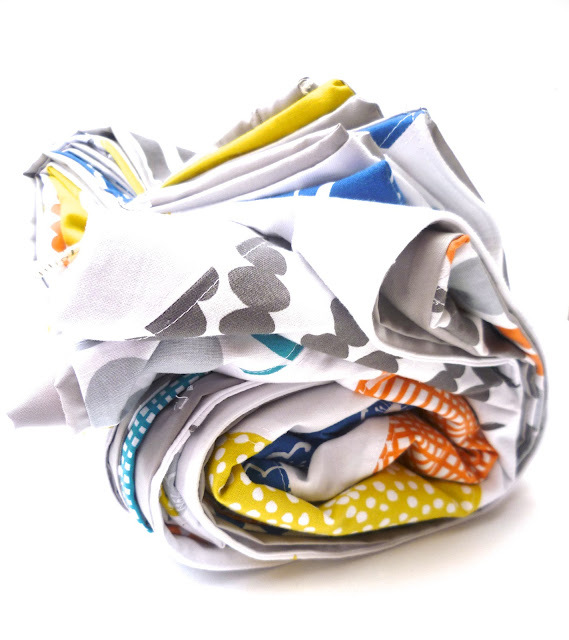 Village Haberdashery has only been online for a few months but Annie has been quick to establish herself as a go-to online shop for fabric, notions and more! She got in touch when she first set up and the site looked good then- the first thing I noticed months ago was that she stocked Umbrella Prints, an Australian company who I have not seen anywhere else in the UK and Anna Maria Horner's Velveteens- soft tactile prints, great for scarves- also hard to find in UK. This is typical of Annie's ethos. She is quick to spot a new trend- I noticed she was one of the first UK shops to announce she would stock Liberty Lifestyle and the new Art Gallery LillyBelle Range desgined by Bari J- I think both of these lines are going to be huge. and Thomas Knauer- the designer behind 'Flock' with an interesting background in academia here. I met Annie in person at Fat Quarterly Retreat and I think it was that which made me so happy to have her as a new sponsor. You can read an in-depth interview with her here. I love to see shops run by genuine enthusiasts that love to make the same stuff as they sell. Annie regularly features easily accessible projects on her website in a virtual 'shop window' with all the 'how to' info on her Daily Stitch blog. 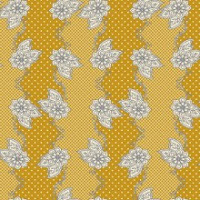 I am in the middle of a 'coming soon' project featuring the new Windham Fabrics Lotta line, 'Bella' which she will be stocking- a sneak peek is below! 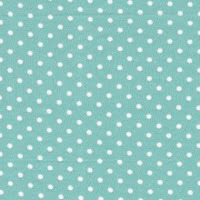 There is more, beyond the fabric there are embroidery and knitting supplies along with great dress making patterns and notions- all beautifully presented on a great looking and functioning website. 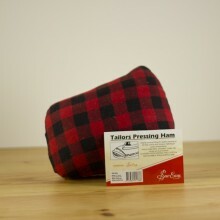 I have to show this as I haven't seen a tailor's ham in a shop online before! These are used in dress making where you need something curved to press your seam or dart on. And an Anna Maria Horner tapestry kit because it looks so sumptuous and beautiful!